The Cut of a diamond refers to its proportions and finish. 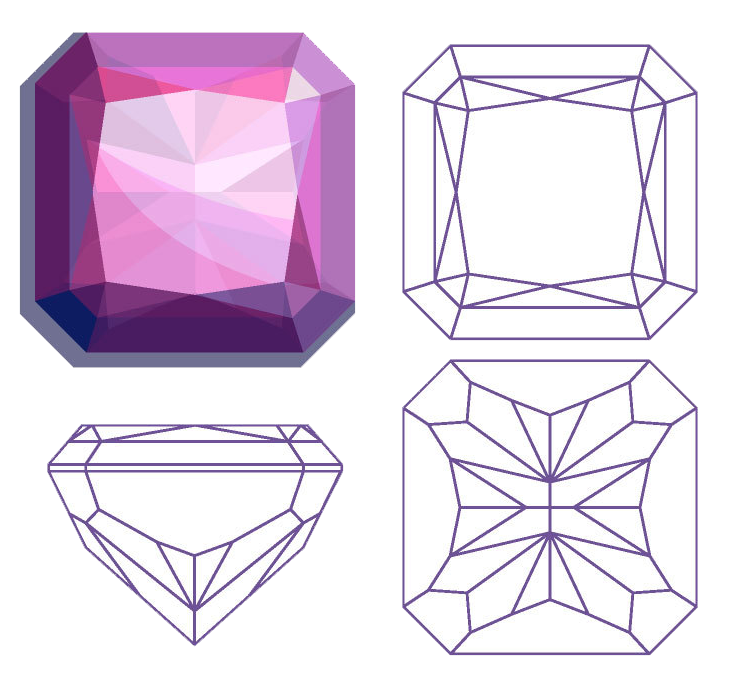 The Cut Grade is a ranking based on the combined analysis of a diamond’s proportions, polish, and symmetry. These factors determine the way light interacts with the stone. The cut of a diamond refers to its proportions and finish and is often referred to as the “make” of the diamond. 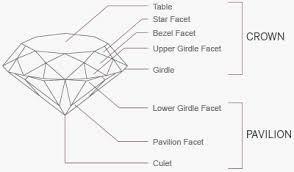 The angles of the facets, the symmetry of the diamond and the quality of the polish all affect the cut grade. 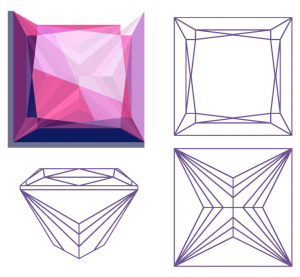 A visual assessment of the diamond can give a good indication of the cut grade, though measurement of the facets and various angles is required for a truly accurate grading. For example, the amount of brightness (or brilliance) a diamond exudes gives a good indication of the grade; the brighter the diamond, generally the better the cut grade. GIA’s cut grades for round brilliant diamonds range from Excellent (EX) to Very Good (VG) to Good (G) to Fair (F) to Poor (P). GIA does not give cut grades on fancy shaped diamonds (i.e. non-rounds). Which diamond gem laboratory has the best cut grading system? Most diamond grading laboratories take fairly accurate and similar measurements. 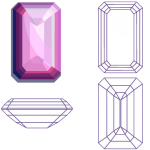 However, not all gem labs classify cut and proportions equally. What may be a Well Cut Diamond to a jeweler may not be a Well Cut Diamond to experienced diamond dealers. The reasons for this are endless but below we explain a few things on a report that will positively and negatively affect the value of your diamond. GIA’s cut grading system is broadly defined within the five classifications (Excellent, Very Good, Good, Fair, Poor). At times this can be a little confusing as not all diamonds within each Cut Grade are equal in beauty and proportions. This is very important to understand, to avoid confusion when pricing your diamond and your expectations as to the selling price of your diamond. In our opinion, diamond dealers and buyers still hold to the traditional or modern model of an ideal cut diamond or something close to it. 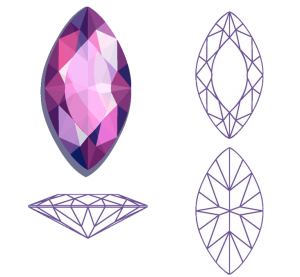 Once a diamond’s proportions start to deviate too much from the model below, the value starts decreasing compared to diamonds that do have these ideal proportions. As a general rule a GIA diamond with an Excellent Cut grade with both Excellent polish and symmetry is overall a great cut stone. Most everyone in the diamond business will agree. And most these Excellent cuts will resemble something similar to the above diagram. But not all GIA VERY GOOD Cut graded diamonds have the same proportions. And not all VG cut grades from GIA will be considered a Well Cut Diamond Very Good Cut grades will have wide ranges in values. With all other variables being equal, a 1.75 ct Round with a Very Good Cut Grade with a wide 64% table facet (top facet) will receive a lower offer than a 1.75 Very Good cut with a 58% table. But both can still be classified as a Very Good Cut. The reason is that diamonds with larger table facets are often less brilliant diamonds than those with table size of 53 to 57%. Below are two different 3.50 ct diamonds that are both assigned a Very Good Cut Grade. Diamond #2 has been assigned only “Good” symmetry. Diamond No. 2 will be have a lower per carat value than Diamond #1. This may seem like a small difference, but in the world of diamonds the difference in a symmetry grade can have a huge affect on your selling price and an offer from a diamond buyer. On high-end diamonds with expensive per carat prices, buyers want perfectly cuts diamonds. “Good” symmetry can reduce the diamond’s value if you are trying to obtain the same price for a diamond with the same size, color and clarity that has better proportions and VG or EX Symmetry. Deep and shallow diamonds do not display the same brilliance as an excellent cut diamond will display. Deep and shallow proportioned diamonds will be discounted in value compared to diamonds comparable in quality. For example, a 1.00ct diamond, with excellent proportions, should have a diameter of approximately 6.5 mm. 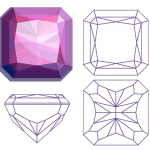 (Add image of excellent diamond). If your 1.0ct diamond measures 6.0 mm, it is likely a very deep diamond. The narrower the diamond’s diameter often means the deeper the diamond from top to bottom. 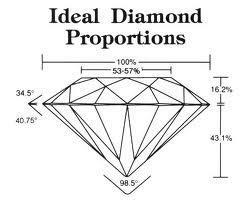 If your 1.0 ct diamond measures 6.8 mm, your diamond is likely a very shallow diamond. The wider the diamond’s diameter often means the shallower the diamond is from top to bottom. 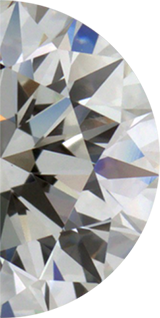 (Add image of shallow cut diamond). 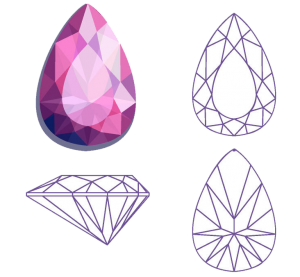 Deep and shallow diamonds are worth less per carat than excellent cut diamonds of equal weight and quality as shown above. That is why these millimeters measurements, among other factors, are very important in terms of beauty and value. See our Millimeter to Carats Weight Conversion chart to reference proper diameter measurements. Diamonds are cut into numerous shapes, with the most popular being the round brilliant diamond. Fancy shapes include Princess, Emerald, Oval, Marquise, Pear, Asscher, Radiant, Heart, Cushion, Baguette and Trillion, among others. 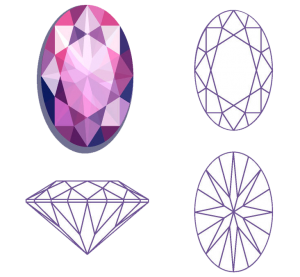 As a general rule, Round Brilliants sell for higher per carat prices than Fancy Shaped Diamonds. Rounds have consistently been the most popular shaped diamond as they are the top seller in the global diamond market. 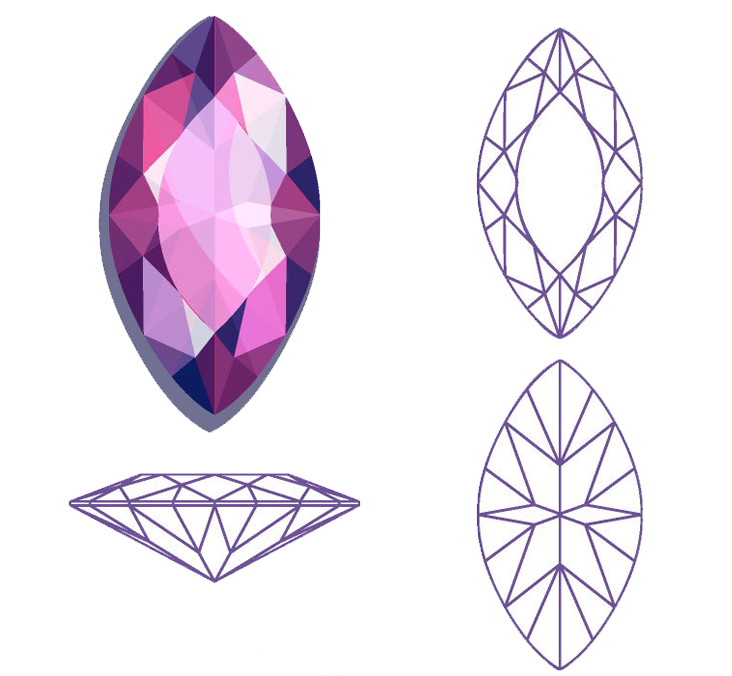 A Well Cut 4.50 ct Round Diamond D VVS2 will command more than a 30% higher per carat price than a Well Cut 4.50 ct Pear Shaped D VVS2 diamond. 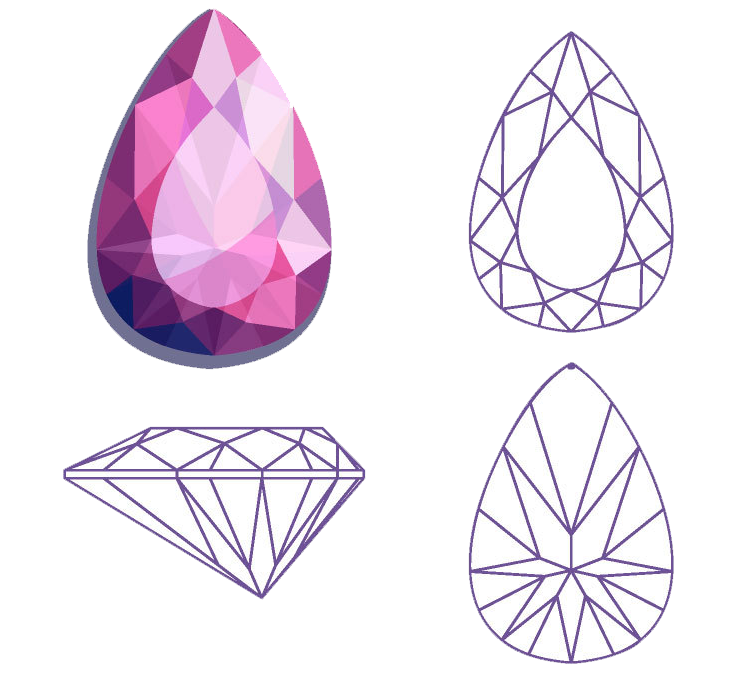 Per carat values may theoretically be used for most fancy shape diamonds. But since not all fancy shaped diamond have the same demand, some fancy shapes will sell at deeper discounts and lower prices than others. For example, Marquise Shaped diamonds are a diamond shape that have lost appeal in many markets. A 3.0 ct Marquise will most likely not receive the same offer as a 3.0 ct Princess Cut of equal quality, since square princess cuts are more saleable and in demand. Today’s diamond industry is greatly influenced by the diamond grading report. It is not uncommon for buyers to make offers and purchase diamonds primarily based on the report and its comments without even seeing the diamond in person first. Polish and symmetry combinations of Very Good, Very Good (VG VG) or Excellent, Excellent (EX EX) will regularly sell for more money than diamonds with only a polish and symmetry of Re-cutting Good, Good (GG). You may have a beautiful diamond with great brilliance and fire, but on the diamond grading report, diamond buyers look for the VG or EX grade. The experienced diamond buyer has a trained eye and can see the difference in diamonds with Excellent or Very Good symmetry compared to diamonds with only “Good” symmetry. Having “Fair” or “Poor” symmetry on quality diamonds reduces its per carat value compared to diamonds with higher polish and symmetry grades. 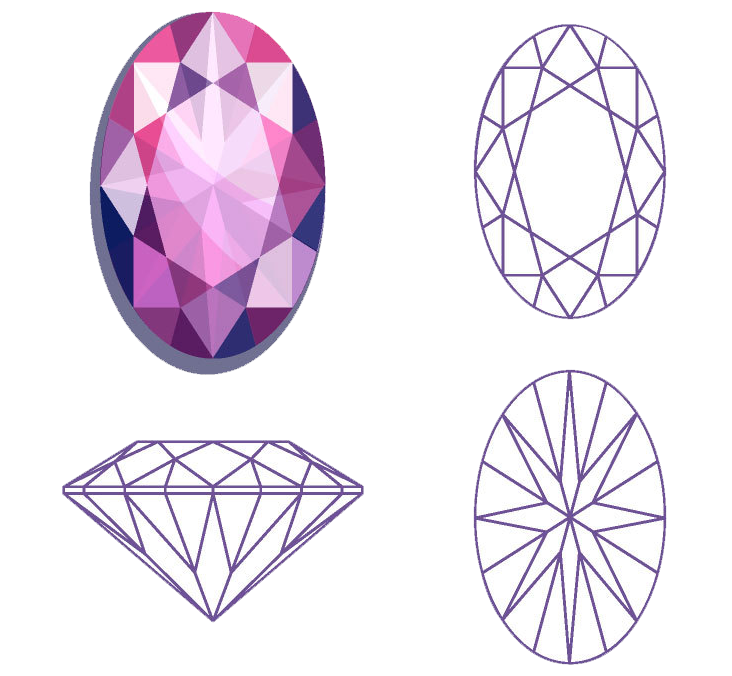 Every diamond has different measurements, proportions, angles, etc. And each plays their role in the beauty your stone displays and its value. There endless amounts of combinations of measurements and proportions within each cut grade. Round diamonds should be “in-round” and not more than .10 mm difference in diameter, with a one to one ratio (1:00 to 1:00). A diamond may start to appear lumpy or not circular once the difference in the diameter exceeds .10 mm between the minimum and maximum millimeter measurements. For example, a 1.0 ct diamond that has a minimum 6.0 mm and maximum of 6.3 mm millimeters will likely look out-of-round. This is often more noticeable in large round brilliant diamonds. Well cut round diamonds should appear as a “perfect circle” from the top view. Diamonds that are not in-round and have a lumpy appearance will be valued at a discount compared to diamonds that have a nice circular appearance. Fancy shaped diamonds come in many length-to-width combinations. Fancy shaped diamonds that are too short or too long are worth less than those with the “preferred” L/W ratios. The preferred length-to-width ratios are much easier to market and sell. 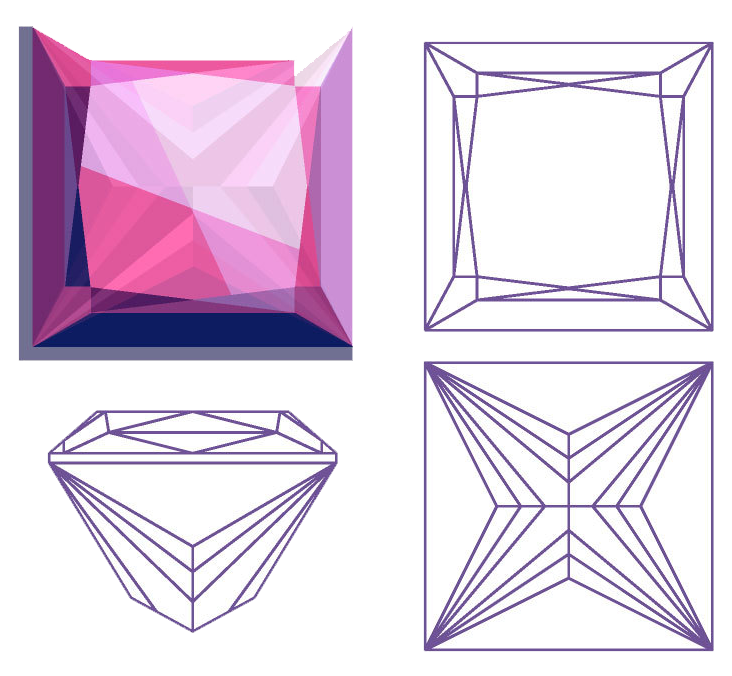 Square Princess Cut diamonds with 1:00 to 1:05 L/W ratios are in much higher demand than a Rectangular Princess Cuts with a L/W ratio exceeding 1:00 to 1.05. Pear shaped diamonds are most beautiful when they resemble a tear drop with a 1.5 or 1.6 to 1:00 length to width ratio. A Pear Shape diamond that is too long or too short will not yield a strong selling price. The universal preferred length to width ration is 2:00 to 1:00 for a Marquise shaped diamond. This gives the Marquise diamond a balanced look. Marquise can be long and skinny to fat and chubby. Neither of these are popular or easy to sell. Marquise diamond, in general, both excellent cut or not, are not in strong demand which often lower their per carat value compared than other fancy shaped diamonds. However, The Diamond Trade has a market for Marquise Diamonds and purchases them regularly. Oval shaped diamonds appear best with a 1:5 to 1:00 ratio. If an Oval is too short or fat it starts to look like a round brilliant that is poorly cut and out-of-round. A long Oval shape is not complimentary to the cut. 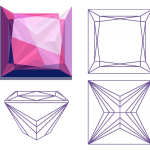 There is established preferred length-to width ratios for these cuts but in Radiant, Emeralds, Asscher Cuts, but personal preference varies more than in fancy shaped diamonds. The main point: if the fancy shaped diamond is not within the “preferred” L/W Ratios, the diamond will have a reduced value and its marketability will be significantly impaired compared to rival diamonds on the market. If there is no demand for a fancy shape diamond because the shape is off, outdated, or simply poorly made, the diamond is often a candidate to be re-cut to improve “the make”. Old and antique shaped diamonds have a broad market but not all buyers will purchase these special stones. These shapes include, but are not limited to: Old European Cut diamonds, Old Miner Cut diamonds, Transitional Cut diamonds, Circular cut diamonds and Antique cushion cut diamonds. These vintage gems do not sell for the same values as modern diamonds with similar carat weight, color, and clarity. Old European Diamonds are considered related to round brilliants in terms of calculating a per carat price. Old Miner Cut Diamonds are considered related to fancy shapes in terms of determining the worth per carat. The individual proportions of your vintage gem will influence the price calculation. Since there are so many variations of these types of diamonds, we suggest sending the details of your antique diamond and any questions we can answer. Most fancy shaped diamonds display an optical effect called “bow-tie” effect. Basically, light is not reflecting out of the diamond properly, creating a black bow-tie appearance in the center of the diamond extending to the outer edges. A strong bow-tie effect will negatively impact the value of your stone and may require recutting to remove. If your diamond has been damaged or is poorly cut, re-cutting the diamond may be an option. Re-cutting your diamond could enhance its value and worth. However, the decision to have a diamond re-cut is not an option most sellers wish to pursue. Having a diamond recut is a considerable expense and risk. If the diamond is damaged or breaks on the cutting wheel during the recutting process, there is no insurance, and you can take a serious loss. Diamond cutters charge anywhere from $100 to $500 per carat or more to re-cut a diamond. For example, a 10ct diamond re-cutting cost can be up to $5,000 dollars. Once re-cut, the diamond must be sent back to the laboratory for grading. It requires years of experience to evaluate whether a diamond can be recut and improved. The measurements and numerous angles must be understood when calculating if the recutting process will improve the diamond and be financially worth the risk. Diamonds lose carat weight when they are re-cut. Reducing the carat weight usually means reducing the per carat value. But the goal to recutting a diamond is often to improve the “make” to create a more beautiful diamond. You have a 5.10ct diamond with only a “Good” Cut grade. It may be possible to recut the diamond and improve the cut to a “Very Good” cut grade. But there is a chance it could dip below the magic number of 5.0 carats. Do you re-cut it? If the diamond recuts to 4.99ct is has now dropped to a lower price bracket reducing per carat price significantly. As you can see, diamond buying and selling can be a challenging decision making business. The “magic numbers” are an important part in making the decision making process to re-cut or not re-cut a diamond. When pricing your diamond, the fact it may need to be recut to make it marketable should be taken into consideration in your asking price.